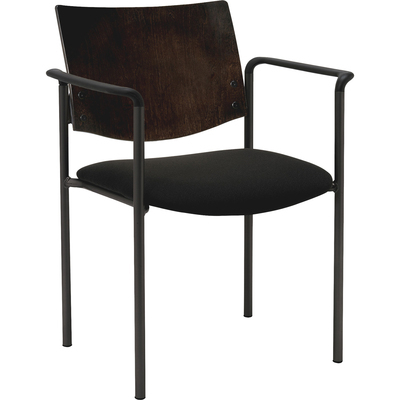 Guest Chairs With Arms Are Ideal As A Side Or Guest Chair In Conference Rooms, Cafeterias Or Any Place You Need An Attractive, Comfortable Place To Sit. 1-1/2" Cushioned Seat Is Upholstered In Black Vinyl. Wood Back Stained In Espresso Color Offers Sturdy Support And Is Made Of Contoured Plywood. Back Frame Is Made Of 7/8" Round Steel Tubing With 16-Gauge Steel. Floor Glides Are Nonmarring To Protect Your Floors. Seat Size Is 15-1/2" Wide X 17-1/2" Deep X 17-1/2" High. Back Measures 18" Wide X 12" High.. Guest Chairs With Arms Are Ideal As A Side Or Guest Chair In Conference Rooms, Cafeterias Or Any Place You Need An Attractive, Comfortable Place To Sit. 1-1/2" Cushioned Seat Is Upholstered In Black Vinyl. Wood Back Stained In Espresso Color Offers Sturdy Support And Is Made Of Contoured Plywood. Back Frame Is Made Of 7/8" Round Steel Tubing With 16-Gauge Steel. Floor Glides Are Nonmarring To Protect Your Floors. Seat Size Is 15-1/2" Wide X 17-1/2" Deep X 17-1/2" High. Back Measures 18" Wide X 12" High.